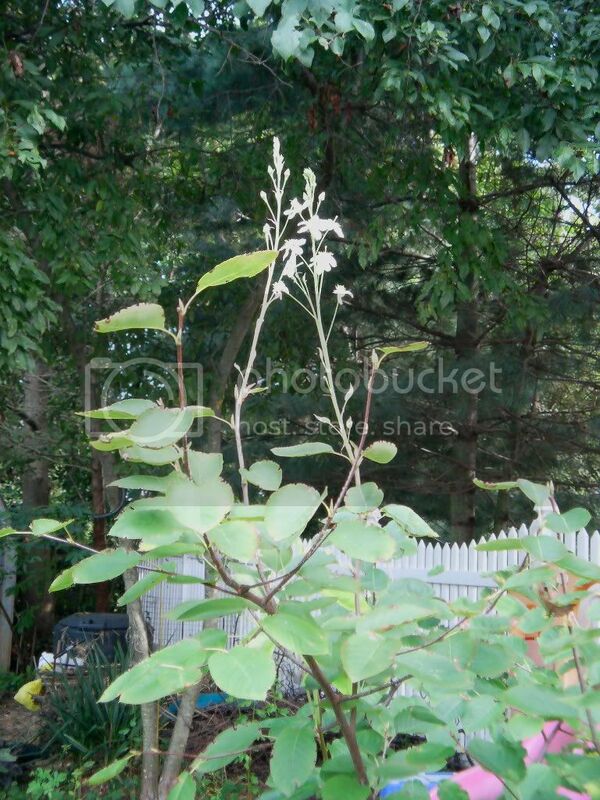 Amelanchier with tiny leaves and flowers ... in Autumn!? It's not exactly fruit but it's in the Apple family.... My Amelanchier (pretty sure it's laevis -- Allegheny Serviceberry) is confused. Any clue why it's growing these ridiculous, tiny-leaved shoots and FLOWERING when Autumn is coming? I don't mean to threadjack, applestar, and I'm not looking for an answer for my flower here in the Growing Fruit section. I just wanted to note that I have a peony that's doing pretty much the same thing, i.e. leaves about 1/2 normal size and strange flowers. The flowers are nothing like normal peony flowers ... these are racemes. Just plain weird! The plant bloomed normally in the spring. Do you suppose some type of virus might cause plants to behave in this way? Just a thought and continuing the theme of weird kind of growth formations, but I don't know about your serviceberry. Has the weather been strange? Sometimes if it gets cold and then warm again, it tricks them. My big old lilac (definitely not one of the new reblooming hybrids) has put out a few blooms in fall under those conditions. aw, c'mon, it counts as fruit. Well, my new shrub variety Amelanchier 'Regent' Juneberry did produce fruit this year -- more than 5 but less than 10 They *WERE* very tasty. Is this tree just confused by the cold snap followed by normal late summer/early fall temps, or could it be Little Leaf (Zinc Deficiency)? Anybody know Maybe I should just toss some toilet paper tubes around it. still can't really help with your question(s), but just wanted to sing the praises of serviceberries a bit more. my neighborhood has a number of VERY productive bushes in public spots, and most people assume since they don't really recognise the the fruit, that it's not food...leaving my friends and i with access to gallons and gallons of the fruit every year (so much so that they are frequently referred to as 'freeberries')...the fruit is delicious, kinda like blueberry applesauce, with hints of vanilla...very nice. pretty easy to see why they aren't really a marketable fruit variety, though. the berries tend to separate from the stems when picked, leaving little holes which make shelf life really brief (and shipping impossible, i'd guess), and the seeds are just large enough to be pretty noticeable...i've seen some blueberry devotees turned off by the 'coarse' seeds...but since the seeds are where the tiny bit of vanilla-ish flavor come from, i've got no complaints. actually, especially with the help of the heap of wild blueberries we picked not long ago, and since we still have bags upon bags of serviceberries in the freezer, it may be about time to convince my dear wife that we're due for another freeberry pie. One of the common names for serviceberry used to be pieberry, presumably because that is the best use for them. huh, hadn't heard that one. sarvis, juneberry, yes....but pieberry is certainly a fitting name. Help, tiny red spots on apple and plum leaves.